We submit to the record that the Shelby Cobra is the coolest American car ever to go into production. Whether or not you agree, there's no denying the fact that the car that Carroll built is a legend in both street and racing circles, and it was the first car from waving the Stars and Stripes to truly upset the German and Italian motorsports hierarchy. Impressive credentials, then. But is the Cobra the fastest car ever to wear the Shelby badge? Ah, now that's an entirely different matter altogether, and one the boys from Hot Rod decided to put to the test. In one corner we have the incumbent 427 SC Cobra. Its challenger, bringing 750 supercharged horsepower to the ring, is none other than the 2011 Shelby GT500 Super Snake. Mirror, mirror, on the wall... which is the baddest of them all? To find out, Hot Rod lined the two track-tuned beasts against each other for two separate tests: a road course and the drag strip. And the winner is? See for yourself in the video after the jump. Thanks for the tip, Jason! 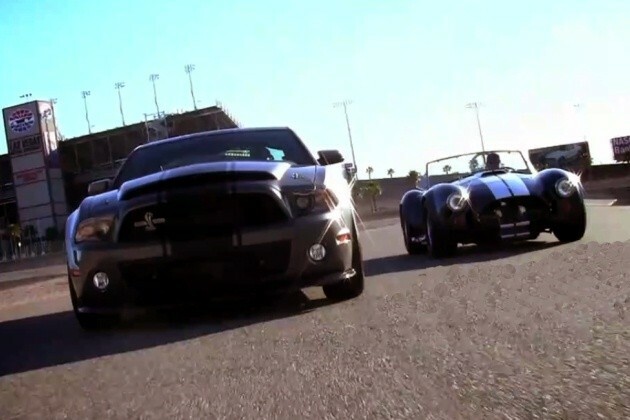 Video: Hot Rod pits Shelby Cobra against Super Snake, baddest crowned originally appeared on Autoblog on Thu, 03 Feb 2011 14:58:00 EST. Please see our terms for use of feeds.